We’ve hit a Milestone! The Embroidery Coach is celebrating our 10th Anniversary this October 2017! To celebrate this special time I wanted to give some of the students that have been part of The Embroidery Coach family recognition for their accomplishments! We have had many students send in their stories and I wanted to be able to showcase some of those special embroiderers! As we read through all of their letters, we just felt so grateful that so many people have been helped by our courses and coaching! It’s such a wonderful feeling, and we thank you! Below is a list of the embroiderers that sent in their stories to be featured in the 10th Anniversary Newsletter – Click On The Link in their name to Read Their Story! It has been about a year since I timidly asked for help from you by subscribing to your most basic program. I knew little to nothing about embroidery. I had started my business not long ago by buying an embroidery machine and a starter kit from the machine’s seller. There was a lot of material on youtube and other sites, but not enough time to absorb the information I needed nor to filter it. Counting stars or searching for related videos required the same amount of effort. I felt stressed and hopeless – a scared sailor in the middle of the storm without knowing how to sail the boat. It was then when my husband found your website and registered me. I reluctantly followed the link and started to familiarize myself with the menus and buttons. My first impression was that I had opened a chest of treasures. The way the information was organized gave me hope. The first lesson was promising and encouraged me to continue. The second lesson brought more information, built on the foundation of the first lesson and so on. Every week a new lesson; every new lesson uncovering new secrets; every newly disclosed secret increasing the confidence in the success of the business. The videos included in the lessons, all the templates, all the little tips, and tricks complemented each other like a puzzle and managed to transform my fear into my passion. I could see now the sunrays behind the stormy clouds, I could find the strength to hold the steering and the luxury of dreaming of my first happy customer. It was a grain of luck too. A closed business offered some of its customers. When dealing with them I kept your written advice run in my mind like a broken record. Did not miss a syllable. And those customers came to give it a try and continued to stay on board. One of them even praised my precision in positioning the embroidery and referred my services to other people. So, the other customers were gained through the word of mouth. They have become repeat clients. A second embroidery machine has found home in my shop to answer the increasing volume of required work. Of course, there is still room for improvement. I am willing to perfect the knowledge I gained through your lessons and also to apply it in different ways. I am paying attention to the new trends in the industry, to the various and ever-changing ways in which the customers’ psychology evolves. I have planned to ask you for personal coaching to move the business to a new level, but I don’t feel ready yet. I would like to take this opportunity to thank you one more time for helping me grow the seeds of my embroidery business into a vigorous multi-petal flower through the power of your training. My best wishes for you and your coaching business. I live and work in the UK and my business name is JB Rosettes & Embroidery. I have been embroidering for approximately 6 years and my workshop is in our garden. I have one full-time member of staff, Caroline, who works solely on making rosettes whilst I help with rosettes in the busy times and do any embroidery orders that come in. I have an SWF compact single head machine which I purchased from new about 5 years ago. So…… In the UK, when you purchase your embroidery machine, it turns up, it is installed in your workplace and the nice chap gives you half a days training in how to operate it. Needless to say, I couldn’t remember half of what he said and had to train myself (I still don’t know half of what the machine is capable of I’m sure). As I didn’t know any better, I purchased my threads and backing from the company that I got the embroidery machine from which I have since found out, are not the best, nor the cheapest. I thought that embroidery would be a nice add-on to my existing business of making rosettes for horse shows and I promptly murdered my best horse rugs trying to put our ponies names on them. Through trial and error, I worked out how to do a not too bad job. I also did jackets for us to wear at horse shows which were OK (but now I know I wouldn’t let them out the door). I did small orders which my customers were happy with but I was quite happy to let the machine sit quietly in the corner giving spiders a home. We were extremely busy with rosettes last year and I need to update my machinery and the only way I could see of making some extra cash to buy the machinery was to resurrect the embroidery side of the business. 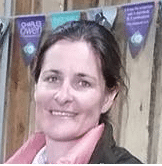 I had become adept at putting new customers off and not taking on any jobs that I thought would be difficult or that I might make a mess of – I was incompetent and not confident. During the winter months, the rosette trade is more quiet so I had a think about how to try to turn the business around. I knew I needed to be better at what I did, I needed to certainly make more money and I needed to be confident. I decided that my first thing to do would be to purchase some good software. I had Wings which I bought with my machine, but having had no training on its use, all I could do was lettering. I had only found out a few months earlier that I had to put underlay stitching under the lettering so you will now realise how bad at my job I really was! I decided that I would purchase Wilcom software as it is supposed to be the best on the market (and also it is really the only option to buy in the UK). Once I got it, my reasoning was to cut out the person that did my digitizing so I could make a saving on all new setups. EEEEkkkkk! I didn’t have a clue! I looked on their website and found that they had some trainers that would come out to a business and get the software set up. Pete was duly booked to come out between Christmas and the New Year when our office is closed. He asked me what I wanted to know and I really couldn’t answer him – at that time I didn’t know I was bad at my job you see 🙁 He set up my software and then asked me to show him how I hooped up. That is where my quest for the Holy Grail of embroidery knowledge was borne. I didn’t know there were different types of backing apart from tear away. I was frightened to change needles. I was using pre-wound bobbins and I could have used ones I find myself on the machine. My website was rubbish. I didn’t have a logo. Basically, I didn’t have a clue! I needed this man! I booked him to come back two weeks later and I built a new website, got a logo made up and embroidered workwear for me and Caroline. He left me samples of threads and backing and told me that I had to actually hoop up with the backing in the hoop (but it was so tricky which is why I had never done it). I worked out how to use the lettering in the software after Pete had pointed me in the right direction. I started to look at tutorials on YouTube and found that there is actually very little info for professional embroiderers, although plenty for domestic embroiderers. I found most info came from the USA with recommendations for digitizing companies that sold nice designs. This is where I found The Embroidery Coach. But alas now my funds had run out and I had to soldier on throughout the spring and summer. There is no doubt about it, I was much-improved thanks to Pete, Wilcom, and Madiera (for backings and thread). Once I got time away from making rosettes I saw a special offer from The Embroidery Coach and, hey presto! my quest was over. I have joined the training at the Gold level. The videos are so informative and in the correct order to learn. As I said on Facebook, better than Netflix by far! So now I know there are different needles for different fabrics. I know that all logos MUST be in the same place and to use the scary All-In-One Hooper. I have discovered the miracle of tension gadgets (still working on their use but everything is already improved). I realise that the backing needs to be in the hoop with the garment for good registration, not separate. I have purchased a steamer to finish my garments and how to use the ball to get rid of excess topping (I was spraying with water before and making an unholy mess and trying to dry them quickly with the hairdryer). I am putting water soluble topping on top of polo shirts and other garments and getting a much better result. I can unpick with my new unpicker and then put the garment back into the machine and continue with a perfect result…. the list is endless. To cut a long story short, I have learned how to improve my performance in each and every section and video. I need to go back over everything as I have just skimmed to get myself out of jams so far but the long and short of it is, I AM CONFIDENT, I AM CAPABLE and I’m NO LONGER AFRAID………….. well maybe still at caps as they are things of evil………. I am going to continue to learn through the Coaching site and try to build up my client base. I need to get more corporate customers so I am going to start networking in the New Year. I am going to move around equipment in my office to make me more efficient. I am going to learn to digitize properly. I am going to find out where you get the lovely clear plastic measuring tools so I can be more accurate. I am going to learn how to embroider on Xmas cards and also make coasters to give to clients (although my logo will need to be changed for that). I am never, ever going to turn an order down again unless I know I cant turn it around quickly enough for my client. When I took Joyce’s pricing class I had already been in business with a small storefront embroidery shop for 5 years and I was nervous to spend the money to take the class for fear it wouldn’t provide any useful information but boy was I wrong! I took the class to see if I was pricing my services correctly and quickly found out I was not. One important thing I learned is that you can not compare your pricing to other shops unless you are set up exactly the same which most shops are not, meaning exact same overhead cost and the same number of embroidery machine heads. The class was great building each week with new information giving you time to “do your homework” before the next class. Also doing a group class was very helpful being able to hear from other embroidery business owners about their business. Joyce’s class helped me tailor my pricing very specifically to my shop and I now use the pricing structure every day and I’m not afraid to give a price a customer may not want to pay because I’m reminded this is what my shop must charge to make a profit. Joyce provided one on one time to work with my overhead numbers to make sure my pricing spreadsheet was correct. I’ve increased my profits especially on customers that like to bring in their own products for monogramming and definitely have a much better understanding of setting pricing based on the number of pieces and the stitch count. Also, I’ve realized that working with a contract embroiderer for large jobs works great for me and my customers know they will be provided quality embroidery and in a week or less turn around time and I can still make money. Joyce is a wealth of knowledge and I would recommend the class to anyone no matter how long they have been in the embroidery business. 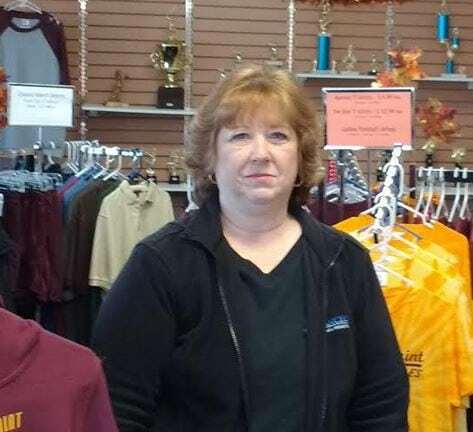 I run my shop by myself, no family members or business partners so it was great to have help from someone who has been in the business for years and could help me with specific industry questions. Running a business is hard but I definitely feel more confident in my pricing structure, especially when customers want to compare you to someone working out of their home with very little overhead. We sort of became embroiderers by accident. Our beginning is pretty humble, actually. My wife was doing some occasional monogramming for friends and family on her home machine in 2014. By chance, a friend asked her to start taking on work from her store and that’s where it really began. It became clear very quickly that a home machine would not be able to do the kinds of work she was being asked to do. We looked around and found a commercial 1501 and took the leap. Needless to say, it can be pretty intimidating when a commercial machine shows up at your house when you don’t have any experience in embroidery at that level. I started looking around online and stumbled upon Joyce’s website and immediately signed up. It was one of the best things we could have done. So many questions were answered and the knowledge we gained really laid a strong foundation to build upon. We stayed members for many months and constantly went to her site for reference. Almost 4 years later we still pull out “the book” (each operator has one) which we compiled from Joyce’s lessons. Her placement guide is our absolute “go-to” when we run flats. We’ve had our bad days, for sure, and nothing beats trial and error, but where you get your initial knowledge is critical to progress, and Joyce’s instruction was an important part of our start. The next area of improvement for us, and hopefully with Joyce’s instruction, is process improvement, the actual nuts, bolts, and workflow of our shop. Thanks, Joyce. We’ve really appreciated your lessons these past few years. 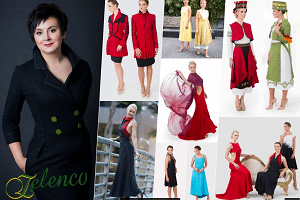 The Zelenco story is one comprised of many elements woven together, much like each item of clothing created by its founder, Halyna Hostetler. As distinctive as the pieces she creates, Halyna traveled a path that began in her home country of Ukraine. Raised in a very small village, she warmly recalls embroidering for hours among friends and neighbors while everyone broke into song and socialized. It is these moments along with those spent with her doting mother that Halyna cherishes the most. Indeed, it is in memory of her mother that the name ‘Zelenco’ was chosen for her brand, a tribute to the woman who, through her guidance, encouraged Halyna to follow her passion. Through the years, Halyna’s styles evolved from embroidery to stitching and beyond. It was throughout this period that the seed was planted in her mind to set off and create a business of her very own. Originally specializing in cross-stitch, Halyna brought her years of accumulated know-how to create handcrafted clothing that distinguished itself from others in the industry, maintaining both exceptional quality and tireless attention to detail. Through her resolve and hard work, Halyna incorporated her own knowledge as well as that gleaned from her mother’s decades of experience to hone her craft to form beautiful and enduring designs, paying special attention to making each color and shape unique. Halyna attributes a great deal of her continued success to weekly coaching by master embroiderer and entrepreneur Joyce Jagger, who provided her with the tools to greatly improve her skills and focus, thereby enabling her to persist with her goals and achieve even greater heights both in terms of skill and business acumen. From childhood memories of her mother’s own works to embroidering in high school to entering the digital age, Halyna remains passionately dedicated to providing exquisite pieces that reflect her own life experience while constantly evolving to meet the needs of an even larger demographic than previously conceived. Her enthusiasm for her craft is unwavering, and each collection serves both as a statement of elegance by the wearer and a reflection of her love for fine fashion and exquisite artistry. I started with The Embroidery Training Resource Center about five months ago. 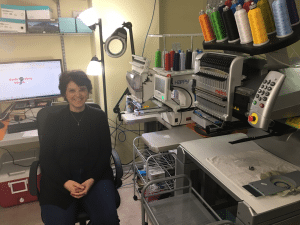 I originally signed up for Tools For Embroidery Business Growth, but as I got into the website, I quickly saw that Joyce offered so much more to assist the professional embroiderer. I had been longing for someone that I could call up and say “How do I do this?”. I have been doing embroidery for about 15 years. I started learning digitizing and embroidery techniques when I owned a sewing machine dealership. I took advantage of every training available, but you only learn so much. I closed my dealership about 10 years ago and returned to the workforce. However, I continued to do embroidery on the side for one organization during that time. I love doing embroidery! So, when my husband had a serious stroke 3 years ago, I quit my job and decided to try to grow my embroidery business. Two things that I knew I needed help on was confidence in my work and marketing my business. When I saw all that Joyce offered, I decided to jump all in. I have become a Gold Plus Lifetime member and a member of the Inner Circle. For as long as I have been doing embroidery, one would think I am an expert, but I am mainly self-taught; watching every video or webinar that I could to improve my talents. I don’t want to be just good at what I do, I want to be the best! Just going through Joyce’s embroidery basics videos, I learned so much! Sometimes the biggest help is in the small tips. Some of the little tips have helped me across the board in my entire business! It’s great to sign up for a service like Joyce offers, but you have to use it to get any benefit. One of the best decisions was to join the Inner Circle. This is a live web meeting with Joyce and a small group of other professional embroiderers. During our Inner Circle meetings, Joyce teaches a lesson, then opens it up for questions. Members often ask questions that are very beneficial to the whole group. In addition, the other members of the Inner Circle will share sources and other tips. 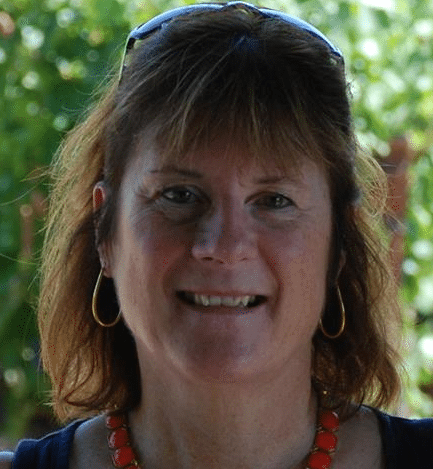 One of the greatest benefits is Joyce walking us through a process, right now, an email marketing system. Marketing is one of the most important parts of any business without it you don’t have any business. In today’s market, so much is done online. I have been wanting to get an email marketing systems going, but didn’t know where to begin. Working with Joyce in the Inner Circle gives me accountability to get the work done and the benefit to ask for help along the way. Joyce is probably the most organized person I know. I think if one looked up the word “organization” in the dictionary they would see “Joyce Jagger” as a definition. She talks a lot about planning and organizing your work. In my personal life, I am quite organized. But my business has been another story. I have a big project that I am pursuing, I am manufacturing a particular item of apparel and doing the embroidery on this item. The supplier/manufacturer that I was using deleted a whole line of apparel. I used one particular piece that I purchased from that manufacturer for the organization for which I do most of my embroidery. What Joyce got me to do was to sit down and write out all of the processes for this item. Now I know how much time it takes and what comes next. As things grow, I now have instructions that I can hand to an employee that they can follow. In this process, I have also looked at my workroom and improved the workflow and organization. I cannot even begin to express the importance of having a mentor like Joyce and how much it has meant to me. When you spend a lot of money for these wonderful machines but don’t want to invest in someone who has been there and done business successfully, it is just stupidity. I know anything that I have invested in my work with Joyce will come back to me, probably tenfold or more. 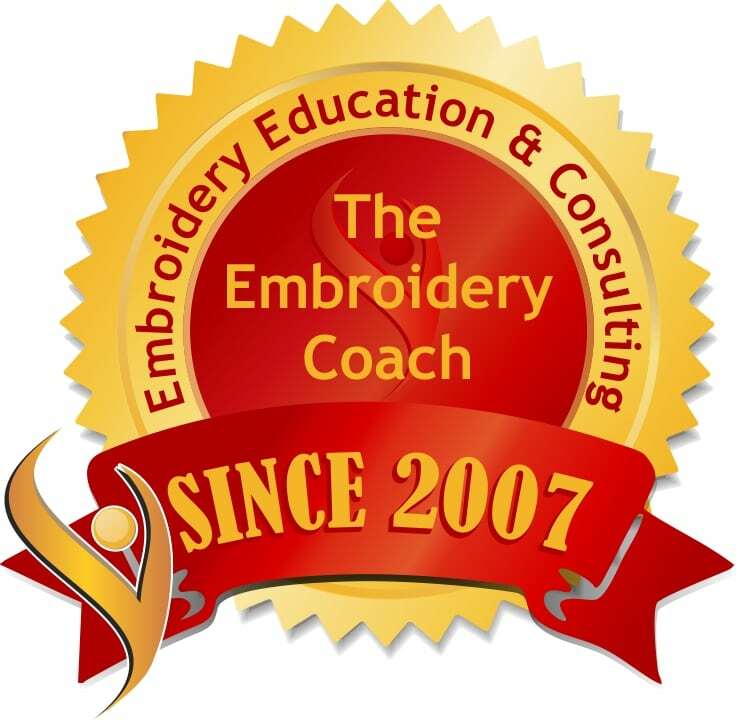 The Embroidery Resource Training Center And The One on One Coaching Has Made A Big Difference In My Business! 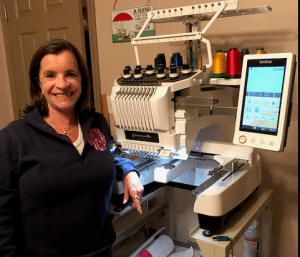 As I think, with many people, after purchasing my machine, I scoured the internet looking for information on how to better my embroidery and came across Joyce’s name. I first signed up for all of her “free stuff”; the newsletter, the free webinars, etc. From there, I progressed to purchasing some of her more in-depth classes such as “How to Price Your Embroidery”, Marketing Classes, and Building a website. Finally, I took the plunge and joined the Embroidery Training Resource Center and then signed up for One on One Coaching. The Embroidery Resource Training Center and the One on One Coaching has made a big difference in my business. The Embroidery Training Resource Center has been invaluable. It truly tells you everything you need to know about the embroidery business. I have used it not only for myself but to help me train my employees. The One on One Coaching has given me the personal attention I need to help me reach my goals faster plus it has saved me money and time. I was about to purchase a shop management program and Joyce told me not to as it would take me forever to get all of my pricing information in. This one piece of advise alone saved my thousands of dollars in software and in time. But I have to tell you I was very skeptical of becoming a Platinum Member and spending money on One to One Coaching. I had worked with the SBDC and one other business coach which left me frustrated and angry as these people where suppose to have the answers. The person at the SBDC had never ran a business before and the business coach had run a restaurant. She was also an expert in Quickbooks. While at that time I was not embroidering, they were not helpful in any way with showing me what I needed to do in order to run a successful business. Because of this previous bad experience, Joyce really had to prove herself with me; that she knew what she was talking about and that she was worth the money I was about to spend. I can honestly say, she has and she is. The results of working with Joyce have been tremendous. The quality of our work has greatly improved. But equally as important is the improvement of the business itself. We have put business systems in place for everything from ordering the garments to processing the actual order to marketing the business. I have even learned how to use various common computer programs such as Excel and Paint. Overall, working with Joyce has made me a better business person. I am more confident in managing the business end and feel good about the quality of work our customers are receiving. However, as everyone knows, running a business and improving it is a continuous process so I will be working with Joyce for quite awhile. Happy Anniversary, Joyce! I look forward to working together for the next 10 Years! There Was So Much To Learn And I Soon Was A Lifetime Member! 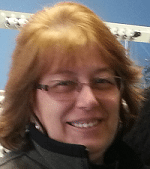 It is actually difficult to recall how I started with Joyce Jagger and The Embroidery Coach program because she has been such an essential and integral part of my business. I purchased a “home” embroidery/sewing machine in 2005, not exactly on a whim- it was more a case of love at first sight when I saw the potential of machine embroidery. With the machine came some basic training but I knew that I needed more, I had begun trying to turn this interest into a business. That was the tricky part; it was hit or miss finding substantial information. Somewhere along the line, probably in Stitches Magazine, I came upon Joyce and signed up at the basic level. There was so much to learn and I soon was a Lifetime member. I was improving my skills within the limitations of the equipment I had- it was pretty frustrating trying to complete an order for a few dozen items with a multi-thread design and having to switch my thread for each color change. So, with Joyce’s guidance and the confidence I had from knowing I wasn’t out here alone, I invested in a single head 15 needle machine and doubled down learning what to do with it. I had weathered an upset in my family which had required me to leave my former job and was at a crossroad- find a new job or take a leap of faith and fully commit to building my business. I will be honest, there have been moments when I questioned my decision. It is one thing to go through the training lessons and practice them with the goal of mastery ( I’m still working on that! ). The most challenging aspect of this whole journey is coordinating learning how to be an effective marketer and improve my skills and manage the business functions. Well, there’s an answer for all of these problems right there in the Embroidery Coach programs-detailed embroidery info, QuickBooks, website & social media instruction, marketing help and now, with the Inner Circle there’s a place to learn while building community among a group of people who I would not have had a chance to meet. I also signed on for One on One Coaching with Joyce because I needed the instruction and support and I knew I couldn’t do it all by myself. There is no way I could have hung in this long without someone to go to in a pinch, fine tune my skills, bounce ideas around with and, yes, to hold me accountable for making progress. I cannot stress how valuable this has been to me. I have a ways to go before I can consider myself an expert at embroidery or the business of embroidery and that’s OK- I know it is a goal worth working toward and that there are resources to help me get there. Joyce Was Tough, No Nonsense. She Has The “This Is What You MUST Do To Succeed” Approach. 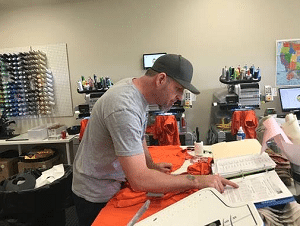 I started my business on my dining room table with a 6-needle machine, completely overwhelmed with the money invested, and the thought of “…what are we doing? Who in the world is going to buy this stuff from me…” Well, it did not take long for the business to grow from the dining room to a sewing room in the basement to a 700 sq. ft. shop to a 2000 sq. ft. shop. Who would have thought? After 5 years in my basement, I retired from my “real job” of 31 years as a Computer Systems Analyst to run my business full time. Here I was again. What the heck am I thinking? Rent, employees, more equipment. I needed experienced people to help me both at the shop and as a coach. Over the years I was glued to the internet, did a lot of research, taken advice from many professionals in the business, attended trade shows and educational seminars, but it wasn’t until I met Joyce that it really all came together. The first time I met Joyce, in retrospect, was a really funny moment. 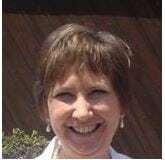 I was following Joyce online with her newsletters and such and was very impressed with her knowledge, willingness to help and freely sharing advice. I was at the ISS show in Atlantic City and low and behold, there she stood – in real life – JOYCE JAGGER. I so wanted to meet her. I was afraid to just walk up and introduce myself, after all, this is JOYCE JAGGER. Well, it took me a couple of laps around the show to convince myself that I should just do it, and I did. She was so friendly, so helpful, so down to earth. She made me feel like my conversation was truly important to her. I was comfortable chatting with her from the start. That changed everything. Money was tight in the business, but I pulled the trigger and purchased a paid membership. I was ready to move on. I needed a business plan. Again, researched online. Good help, but not enough. I purchased Joyce’s Business Plan package and that sealed it. I wrote the plan, submitted it to the bank and shortly after that I moved into my first “real” shop, financed a 4-head machine, and secured working capital. We had already added vinyl cutting and rhinestones to our offerings and were outsourcing screen printing. It soon became evident that I was struggling far more than I ever expected – running the business, managing finances, running production, digitizing designs…too much work, not enough money. I purchased the How to Price Embroidery package. What an incredible difference this made. All of the research I had been doing online – although helpful – was no match for this program. It pulled everything together for me. It was and still is a huge asset. Then, I needed more help. We just could not get the product out fast enough. I was overwhelmed, ready to quit, so in a last-ditch effort, I called Joyce. She would not let me quit. She came down to my little 700 sq. ft. shop and spent a few days going over all sorts of aspects of the business process and workflow with me. We went over the pricing program, the shop layout, outsourcing my digitizing … it was great. That was just the boost that I needed. She was tough, no-nonsense. She has the “this is what you MUST do to succeed” approach. That’s the deal. She was right. Two years later we felt we could make a move and rented a 2000 sq. ft. shop. Here we are, five years after Joyce’s visit and still going strong. Since her visit, I took her 9 Steps to a Profit program. Great, great program. All of her programs provide in-depth direction and information to effectively use them. I’ve continued to read her newsletters faithfully, and her webinars are invaluable. Her topics are very timely. I love that even though I often cannot participate, I can go to the members portal and view the webinars that I may have missed. I have used her strategies to train my operators. Every time I need assistance, she is right there – ready to help. She has even called me on occasion to further discuss issues I’ve had. When I run into her at the ISS show, she recognizes and remembers me every time. Her students are not just a number to her, they are made to feel like friends, like people who truly matter to her. Whether you have a small at home operation or a big successful business, Joyce gives the same level of attention and quality to everyone. If it was not for Joyce, I believe I would have walked away from this business long ago. Joyce Was A Very Big Asset For Me And My Business As I Realized How Much I Love What I Do And Need To Keep My Business Going! When I met Joyce I was in my 5th year of business and still struggling with issues I didn’t quite know how to resolve. I struggled with organization and getting my finances in order. I was always questioning myself if I should stay in business or not. I was so disorganized, my shop was a mess I was constantly looking for things because I didn’t have a specified place for everything. I also struggled with what stabilizers to use for embroidering different fabrics. I would stitch out several different test pieces with backings to see which one seemed to stitch out the best. I wasted a lot of time. I didn’t have a list of things to do daily so I would waste time by trying to do too much in one day causing more frustration. I stumbled across Joyce’s website when I was searching the internet for tips on embroidery. I joined the silver club on her training site. I read on her website that training was available so I called her and asked what I needed to do. I was able to secure a date and sign up for a two-day training. Joyce came to ND to my business and I have to say it was the most valuable two days I could ever have. I was nervous about her coming. I was nervous about her seeing how disorganized I was and her seeing the pieces I had embroidered that I had on display. I worried that my set up was all wrong and I didn’t know how much I could learn in 2 days because I wanted her to teach me everything she knew! But, she put me at ease and we sat down and talked to figure out what I needed to learn first. I think we made a list of what I struggled with the most but also planned on going over everything. The results of her training were amazing. I was now anxious to take on new projects with a renewed confidence in what I was doing. In those two days, I took notes upon notes in which I still rely on today. *We went over small lettering and I learned how to get rid of jump stitches between my letters (I was always clipping them before so the customer wouldn’t see them). I also learned how to get rid of the connecting line between the stem of the i and the dot above it. * I learned the correct backing to use on woven shirts, and knits and also how to stitch on fleece and use solvy so the stitches wouldn’t sink in. *We went over my finances and she gave me advice on using quick books for all my financials and always know what my finances were at all times. *We went over organizing. She gave me very good tips on how to organize different areas of my shop. Knowing how to change the things that I needed to change and knowing the difference of being in the business to make money or being in business to just barely making it. I’ve learned to set goals and make daily lists of what I need to get done. I keep records of each customer’s files and make notes so I know what I need to do for repeat customers. I have more confidence in the work I create and the designs I do for customers and to know they appreciate the extra time I take to make them a happy customer. I feel good that I’m confident on using the right backings for each project. I’m not saying I don’t struggle at times on some items but when I do I’ll go back to my notes or to Joyce’s embroidery training site and watch a video if I need to. Joyce was a very big asset for me and my business as I realized how much I love what I do and need to keep my business going. Honestly had she not been my coach for those two days I don’t know if the business would have survived. I don’t know if I would have had the confidence and drive in myself to keep going. She encouraged me and complimented me on some of the embroidered pieces I had done. That really helped to build up my self- esteem. It was well worth the money and time I spent with Joyce to learn a part of what she knows. I will never know everything there is to this business but I know the time I spent with Joyce was the best learning tool I could ever have. My relationship with Joyce began when I started my embroidery business many years ago. I jumped into embroidery with both feet and landed hard. Searching for help on the internet I came across “Embroidery Tip & More” quickly I signed up for the newsletters. These newsletters I read over and over. I learned about stabilizers, and how to make templates. Time went on and I started selling on eBay. I had found a niche market with livestock & dogs. I made templates for the breed specific designs I had and offered custom embroidery on garments for the farm, ranch, kennel & 4-H members that showed livestock, dog and competed in dog sports. Then, I needed something more; I added a heat press, custom lettering, and rhinestones. This turned out to be not quite enough. So I hired Joyce as a personal coach. This personal coaching opened my eyes to what was actually happening inside and outside my business. Joyce’s way of having me go through my accounting, hooping, ordering and every little detail in my business was hard work, and worth every minute. Joyce never told me I was wrong with what I had done, only gave me suggestions on how to improve my work. Working with Joyce, I was encouraged to try new techniques with embroidery, I even tried embroidering on leather, found out it is not as hard as I thought. Our weekly meetings we had on the phone, I looked forward to. During my time with Joyce, I signed up to be a “Lifetime” member of her Training Resource Center. For me, this is worth every penny. I still ask Joyce questions about processes and I have an answer. If at any time in the future, I need help, I will ask Joyce. It may just be a simple question or a larger issue hiring Joyce, will solve the problem, quickly and efficiently, her guidance is right on target. Thank You For Your Interest In All Of Us Who Love To Embroider! I was frustrated in trying to get my business up and running. I found Joyce’s The Embroidery Coach and started reading and watching her webinars. I have learned so much. I have been in business for 4 years now. Taking baby steps to make my Embroidery and Longarm quilting top notch. Adding embroidery to my business has created another line of customers and I am slowly building this into my business. I was doing okay with my Longarm Quilting, but I have a love for embroidery, so after watching one of Joyce’s webinar, I decided to subscribe to webinars and receive information Joyce presented. I have limited funds but I am saving to purchase her program as there is so much more that Joyce can teach me to improve the Embroidery part of my business. One of her webinars that she offered was pricing. Do not sell yourself short on this. First impressions to the customer is that their product you are working on is important to you and you want to create the best product for that customer. That first conversation you have is about what that project is going to cost and making sure that the customer understands that they will have a project that meets their expectation for that price. Quality and good customer service, which Joyce explains in her webinars are what I try to follow in my embroidery portion of my business. 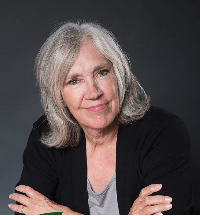 I am part of the program where Joyce sends out the free webinars for a short period of time to learn as much as I can until I can get her full program. Her price is not unreasonable and believe me, I cherish what webinars she offers and take notes to improve my embroidery business that she offers at no cost to me. This is just a tip of the iceberg and getting her Program is my next step into making my embroidery business bigger and better. I am getting there thanks to Joyce’s webinars and email notifications of when they are going to be offered. 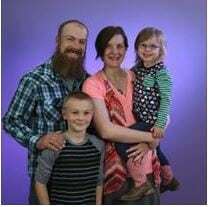 My husband and I have been in the custom sign and apparel business for almost 9 years. We have started our business with vinyl application, added sublimation in 2012 and embroidery in March of this year. Neither I or my husband have any experience in the embroidery business and all that it entails. In my opinion, hiring and working with Joyce has been an absolute time and money saver. Without her expertise, the information required to operate our new machine and provide a beautiful final product would have been impossible. When you are a small business launching a new product, every penny counts and every tiny error hurts. Everything in this field is expensive and almost every job requires additional tools. 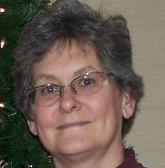 Joyce always provides an answer or directs you to the sales reps that know exactly what you need. Hopefully, by this time next year, I can offer you a much better story! I Am Excited To Finally Say “I Am In The Embroidery Business! 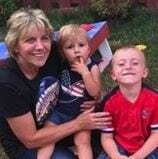 I don’t feel my story qualifies as a success story, but I would like to share it; Having to go to work full time at age 54, through some unfortunate circumstances, I knew I didn’t want to work in a factory beyond my retirement age of 66. In order to do this, I was going to have to do something for an income because my social security will not sustain me. Several years earlier I had a small home-based business doing upholstery and custom drapery. I had to move from my home and start over living in a mobile home. There was not enough space for that kind of business and working full time, it was not feasible to continue it. I attended a sewing expo and was very intrigued with the embroidery machines. That got me to thinking, perhaps this would be an ideal fit for me for a part-time home-based business. I was able to purchase a gently used 12 needle embroidery machine 3 years ago and my journey began. Little did I know how involved machine embroidery was. I started learning what I could from videos and tutorials from the web, but quickly realized if I was going to be a success at this I was going to need more help. I came across Joyce’s website and was so excited. This was what I was looking for. I needed an embroidery coach. I purchased the life time membership and can say it is a wealth of information. It covers every aspect of the embroidery business. One thing that Joyce covers is the importance of pricing your work so you can make a profit. I had a problem with this when I did the upholstery and drapery business. I didn’t feel worthy of charging what it was worth because I was self-taught and was afraid I wouldn’t do a good enough job. With Joyce’s coaching program I can be confident that I can offer an excellent product because of the knowledge I have access to, therefore will be able to price accordingly. Hopefully, my next story will be about my success and with the help of “The Embroidery Coach” I think I will be able to accomplish it. It Gave Me Tips And Techniques! Before becoming a part of this group, I was and still do embroidery. It was a small operation mostly by word of mouth. I wanted to grow my business. I left Corporate America because of an unfortunate incident and knew that I had to continue to earn a living and started a sewing and embroidery company. I also currently work at a quilt shop part-time to help with the bills. Because of my financial situation, I took advantage of Ms. Jagger’s free webinars. Learned so much from how to work with small embroidery fonts, how to do hats, pricing, marketing and much more. My wish was to purchase some of her programs especially the quick books and how to charge for items and invoice customers. To be honest fear and lack of funds stopped me. I read in a magazine how she helped a company grow their business and wished how that could be me. I think the cost was about 5K and I just did not have it. I don’t know if the people in the mag paid that or not. I may be off on my pricing. I learned so much from just watching her free webinars. To share a story, I called Ms. Jagger. I was given the opportunity to bid on a job for a large company and I panicked. I did not have a clue how to price it or what to do. I became a certified women-owned business in my state and companies receive a credit if they do business with a woman/minority-owned business and they called me. I called Ms. Jagger with the hopes that she would talk to me and she did. She gave me some pointers and things that I needed to consider when bidding. She was such a good help and I was grateful that she shared her knowledge with me. The free webinars helped to polish me. It gave me tips and techniques. Since I was able to benefit from the “FREE” stuff, I can only imagine how much further I would be if I made the investment in some of her other programs. I Have Learned So Much In Such A Short Time! I am just getting started with my embroidery and trying to eliminate one of my other 2 jobs so I am not up to snuff yet but I feel I am learning things by the ton for just a beginner!! I can’t believe how much I feel I understand already!! I just have to learn my machine more. My sister is in another state and does embroidery and is impressed with the things I have learned in such a short time! I want to thank you so much for all of the time you have taken here over the years to put this wonderful program together. I know you have made plenty of exceptional embroiderers because of it. You also do it with positive enthusiasm!! That is huge since learning can be frustrating. Your Training Has Given Me More Confidence In What I’ve Done! Hi Joyce. Wish I had a good story for you! But since I’ve had to have to change my locations and star over a few times, I don’t “YET”! But you have helped me tremendously already. You have the forms and organization set in place that I have been trying to figure out on my own for running a business. Might I add, that I’ve NOT been very successful at it! And no one I know knew, knew how to either for embroidery business’. Having self-taught myself most everything about embroidery, your training has given me more confidence in what I’ve done. Confirmed some things, better ideas or ways on some things, learning new things. I am anxious to start The Gold Plus Training! I am looking forward to a great business! Hello, my name is Jean Hamilton and my embroidery business is Jean Hamilton’s Custom Embroidery and Monogramming. I have a home-based business. For 7 years. I am not a member but enjoy your tips each month. My business is very small and I specialize in custom orders for clients that only have one or two items to embroider. Yes, I have made mistakes, but I have not had any training as of yet. Your training would be something for me in the future. My clients appreciate that I will do small orders for them. There are quite a lot of embroidery businesses in my area, but they will not take orders of less than 10 or 15 items. Also, since I am retired, I can accept rush orders, which I charge more for. I like your organizational ideas like a fixed price list, an embroidery contract which my customers sign, and the idea that you sometimes have to tell a customer it cannot be done. That part is very hard for me. Right now I have a customer that wants 12 Christmas stockings monogrammed. The stockings are hand crocheted. Google says to use organza underneath and Solvy on top. Any ideas would be helpful. They are very tight yarn crocheted. I have the clamp hoops to do this. Keep your ideas coming, I truly appreciate them. Jean Hamilton’s Custom Embroidery and Monogramming. I am so truly appreciative of all your tutorials and information that you put on the net as part of your coaching programme. I wait for them as I learn a lot from your tutorials. I have been a member for a little while now and I receive your free information. My story is that I had a major operation that went wrong. They put in a defective prosthesis and I had to have an emergency operation to remove the defective one. As a result, I have suffered severe nerve damage. I had to resign from my job as a Literacy Coordinator where I worked for the Ministry of Education. During my dark days, the only consolation I had was my embroidery and quilting. Without these, I don’t think I would have survived my ordeal. I came across your site one day whilst surfing the net and signed up. I cannot afford to pay for your tutorials as I am unemployed. Therefore I look out for all your free information and tutorials where I pick up a gem of information here and there. Please do not stop providing this type of information for people like me who cannot afford to pay for stuff which is beyond my reach. Thank you and God bless you for your kindness!